The Mavericks legend is finishing up his 21st season in the NBA. Let's look back on his legendary career. DALLAS — Has it really been 21 seasons? Let's look back at Mavericks legend Dirk Nowitzki's greatest moments. Dirk actually wasn't drafted by the Mavericks. Instead, the Milwaukee Bucks picked him ninth overall in the 1998. But Dirk wasn't a Buck for long. In a draft-day trade, Milwaukee sent him to Dallas in exchange for Robert Traylor. But even after the trade to Dallas, it was no sure thing that Dirk would actually play for the Mavs. He decided to make the trip from Germany to Dallas that summer, to see if he wanted to start his career in the NBA. "I don't know yet," Dirk told reporters. 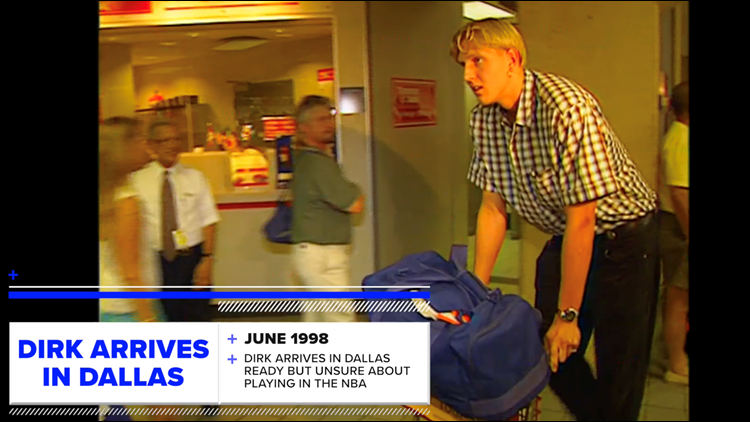 A young Dirk arrives in Dallas after the Mavs traded for him. Spoiler alert: Dirk stuck with the Mavs. After a lockout out delayed the start of the NBA season, Dirk made his debut on Feb. 5, 1999, on the road at Seattle. He played 16 minutes, missed all five field-goal attempts (including one missed three-pointer), and came away with zero rebounds. But he went 2-for-2 from the free-throw line for the first points of his career. It was a start. Shooting 15-for-32 from the field – and 21-for-22 from the free-throw line – Dirk scores 53 points against the Houston Rockets. And the Mavs win, 113-106, in overtime. Facing his old teammate, Steve Nash, and the Phoenix Suns in the Western Conference Finals, Dirk averages 28 points and 13.2 rebounds and leads the Mavs to a 4-2 series victory to clinch their first-ever Finals berth. Dirk scored 50 points in Game 5, as the Mavs won 117-101 to break a 2-2 series tie. Dirk leads the Mavs to the top seed in the Western Conference, averaging 24.6 points per game and shooting a career-best 50 percent from the field. 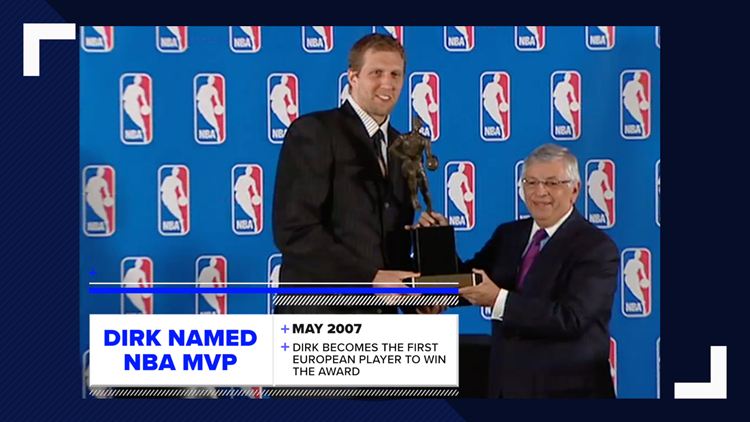 The Mavs lost in the first round of the playoffs, but that didn't take away from Dirk's special season – he was named the NBA MVP, the first European to win the award. Dirk accepts the MVP award in 2007. Less than 10 years into his career, Dirk becomes the franchise's all-time leading scorer. He passed Rolando Blackman's scoring mark. With more than 31,000 points now, we think Dirk's record is safe. The Mavs' second shot at the Heat in the NBA Finals goes much better. After falling behind 2-1 in the series, Dirk – along with Jason Terry, Shawn Marion and Tyson Chandler – led Dallas to three straight wins, including the series-clinching victory at Miami. Dirk becomes just the sixth NBA player of all-time to reach the 30,000-point plateau. He was in good company: Kareem, Karl Malone, Kobe, MJ and Wilt. Adding another milestone to his career, Dirk passes Wilt Chamberlain on the all-time NBA scoring list. WANT MORE DIRK NEWS? CLICK HERE.